Sierra Magazine named The University of Boulder the second Greenest school in the nation. You can read more about how they keep it green here. 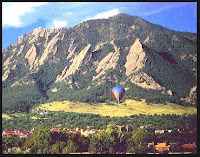 And though there were several East Coast schools that made the list (mostly small liberal arts schools), it made me realize one of the best things about the city I now call home - Boulder is completely Eco Conscious! When I first moved here everyone was always asking me, "Do you miss NYC?" My response was often I don't know yet...I know I miss quick and cheap drop-off launderymats! Now, after being here for a year, I am aware that there are things I miss about the East (mostly my friends and family), but I also know the things I LOVE about my new home which is the detail given by nearly everyone to keep and protect our shared environment. Besides the Jitterbugs :) it's also what I miss most about Seattle. The east coast still has a long way to go in order to catch up to the west coast on the "green" issues.